Blood clots that become lodged deep within the veins of our legs are called deep vein thrombosis, or DVT, and they can be deadly. Not only does the clot block blood flow to the affected area, it can sometimes break loose and travel to the heart or lungs where it has the potential to cause death. Certain illnesses increase your risk for DVT, including cancer, heart disease, inflammatory bowel disease, and inherited clotting disorders. But there is risk for anyone, even in absence of these conditions. That’s why it is so important to be aware of the role that diet plays in the formation of DVT. There is actually a lot that you can do to make a difference. Luckily, DVT is treatable if you catch it early enough. But why take the risk when it is so easy to significantly lower your odds of developing a clot just by eating more delicious foods? None of the 7 clot-prevention foods on our list should be challenging to add to your diet. In fact, we guarantee you’re going to love #7 – we saved the best for last! One serious contributing factor to blood clots is dehydration. When you don’t have enough water in your blood, it thickens. This pushes your risk for a clot way up. Though experts have recently cast doubt on the standard recommendation for six to eight 8-ounce glasses of water each day, making sure you drink at least that much can give you peace of mind. Another way to check if you’re getting enough water is to look at the color of your urine. It should be light yellow or nearly clear. If it is orange or brown in color, you are not getting enough water to lower your risk of DVT. A diet high in fruits and vegetables is important for health on so many levels, including the prevention of DVT. However, researchers from the University of Oslo in Norway suggest that kiwi fruit rises above the rest in terms of preventing dangerous clots. Their study found that people who ate 2-3 kiwi fruits each day had lower platelet activation, the mechanism by which blood clots, than people who ate none. Lower platelet activation translates to a lower risk of blood clots, and kiwi was also found to lower cholesterol levels. But don’t worry if you don’t like kiwi. Other fruits that contain salicylates, which inhibit blood clotting, include oranges, strawberries, blueberries, cranberries, grapes, raisins, and prunes. One of the easiest and most flavorful ways to lower your risk of DVT is to eat a lot of garlic. Beginning in the time of the ancient Egyptians, people have been using garlic as medicine. It has distinct blood-thinning capabilities along with its pungent flavor and odor. But it’s not just garlic. Other herbs and spices high in salicylates include thyme, curry, turmeric, cayenne, paprika, licorice, peppermint, and ginger. Don’t fall into the trap of believing that a healthy diet has to be bland – add that spice. Olive oil is much healthier than vegetable oils for overall cardiovascular health, including the risk of developing blood clots. The American Journal of Clinical Nutrition concluded that it’s the phenols in virgin olive oil that can lower the level of a few substances in blood that promote clots. It’s super easy to use olive oil for cooking, but you can also infuse it with garlic and other clot-busting herbs to make an excellent dressing for salad and bread. Both nuts and whole grains are rich in vitamin E, which is a natural blood thinner. Studies show that consuming more vitamin E can not only reduce your risk of developing a first clot, but also stop people who have already experienced DVT from developing further clots. Great food choices include walnuts, almonds, and hazelnuts.Whole grains like oats, wheat, and lentils are also rich in vitamin E.
Foods that are rich in omega-3 fatty acids help to thin the blood and prevent both clots and strokes. 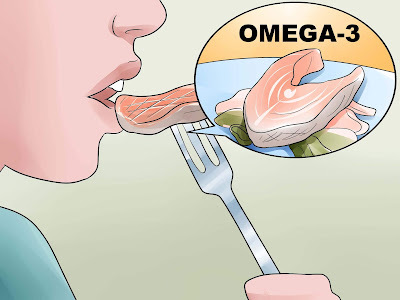 Studies have shown that adding an additional 1.8 grams of omega-3 fatty acids to your diet each day can significantly improve blood flow and decrease the thickness of your arteries. The best known source of omega-3 is fish, especially salmon, herring, mackerel, trout, and anchovies. But there are also great plant sources available for people who don’t care for the taste of fish. Flaxseed and sunflower seeds are rich sources. Here’s the good news. That glass of wine you have in the evenings can actually help prevent the development of blood clots. Red wine is especially good because it contains a high level of the flavonoids that prevent clots by controlling production of platelets. If you don’t drink alcohol, red grape juice is helpful, too. And even if wine is not your thing, alcohol in general is a potent blood thinner. It appears to work by reducing platelet aggregation and fibrinogen levels (fibrinogen is a blood clotter), at the same time increasing fibrinolysis, which is the process that dissolves clots. We’ve talked a lot about the foods that should be added to your diet to reduce the risk of blood clots and dangerous DVT. They are all tasty foods that should not be too difficult to eat. But nothing is ever totally easy when it comes to health. You must also put some attention on reducing your intake of saturated and trans fats. Saturated fat increases inflammation, and this makes it difficult for your blood to flow freely. Therefore, it is important to scale back on full-fat dairy products, fatty cuts of meat, and junk food snacks both salty and sweet. Packaged foods also hide a shocking amount of fat, so be sure to read labels in the store. The good news is that once you bump up the flavor profile of your food with our recommended herbs and spices, drink more water, and enjoy plenty of fruits and nuts, you will feel more satisfied by your daily diet and crave the fatty stuff less. And finally, one of the biggest risks for DVT is a sedentary lifestyle, so make sure you are moving around enough each day, even if you can’t fit in a trip to the gym.